Charlotte Knobloch, who argued that victims' memories would be desecrated once more when passers-by walked on the plaques. Knobloch declined an interview but said in a statement sent by email that she maintained her stance. "People murdered in the Holocaust deserve better than a plaque in the dust, street dirt and even worse filth," she said. So many German cities already have Stolpersteine! After banning them in 2004, Munich is poised to allow the small brass Holocaust memorial plaques known as 'Stolpersteine' to be placed on the streets, despite a Jewish community leader's continued opposition. Ernst Grube, a sprightly 82-year-old Munich native with a ready smile, has had enough. Seventy years after surviving a Nazi concentration camp and losing several close family members to the gas chambers in German-occupied Poland, Grube said the time had come for relatives to be allowed to choose their own way of remembering their dead. Grube's hometown, however, levelled an official ban more than a decade ago on what has become the most personal and popular Holocaust memorial project in Europe today, known as Stolpersteine ("stumbling blocks"). 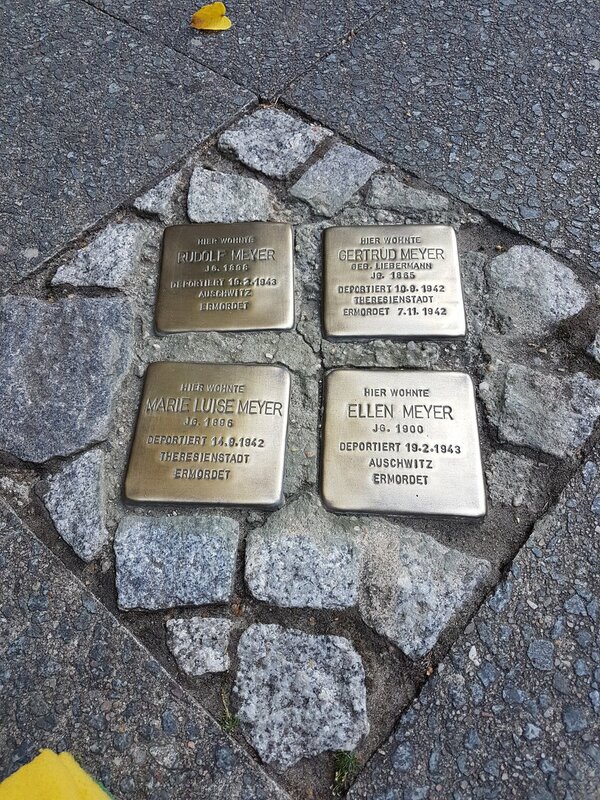 For nearly 20 years, pedestrians have been stumbling across the names of Nazi-era victims on coaster-sized brass plaques embedded in the pavement in front of their last known addresses. The 50,000th Stolperstein was laid this month, ahead of the 70th anniversary on Tuesday of the liberation of the Auschwitz death camp, and they can now be found in more than 1,000 cities and towns throughout Europe. Sculptor Gunter Demnig started the project in 1996 to bring the unfathomable dimensions of the Holocaust down to a human scale. Each Stolperstein bears a stark text, with the name of the victim, birthdate, date of deportation and, if known, date and place of death. However Munich, which was the historical home of the Nazi movement, is the only major German metropolis to outlaw the blocks in public places. The strongest opposition came from an unexpected place: the leader of Munich's 4,000-strong Jewish community, Charlotte Knobloch, who argued that victims' memories would be desecrated once more when passers-by walked on the plaques. The ban was so sweeping that two Stolpersteine, for Jewish art dealers Siegfried and Paula Jordan, were dug up again soon after the 2004 decision. "It was as if my parents were deported a second time," their son, 91-year-old Peter Jordan, wrote to city officials. Grube says he respects Knobloch, who survived the Nazi period in hiding with a Catholic family, but he called her de facto veto outdated and unjust. "I am 82, Frau Knobloch is 82, I was persecuted as a child, Frau Knobloch was persecuted as a child," he said. "Why does her experience count more than mine?" Grube noted that beyond the six million Jews slaughtered in the Holocaust, groups including resistance members, gays, the disabled, Sinti and Roma and Jehovah's Witnesses were also targeted for extermination. Their descendants have now lent their voices to Munich's pro-Stolpersteine campaign. Knobloch suggested "alternatives" including a single memorial with the names of all Munich victims installed at a Nazi party documentation centre due to open in April. The tide, however, may well be turning in favour of the Stolpersteine since the election last year of a new mayor who backs the project, joining proponents including German Chancellor Angela Merkel and Israel's Yad Vashem memorial. An initiative lobbying for Stolpersteine in Munich led by Terry Swartzberg, an energetic American Jew who has lived in Germany for nearly four decades, believes it now has a majority on the city council to overturn the ban as soon as next month. Swartzberg, 61, said he often receives fervent letters of support from the grandchildren of Holocaust victims in Israel and the United States. "They say 'we need Stolpersteine, we want to visit the places where our families lived before they were dragged off to Treblinka, to Auschwitz'," he said. Swartzberg said that after deadly attacks on Jews in Paris and Brussels and the troubling rise of a right-wing populist group in the eastern German city of Dresden, the Stolpersteine could serve as a "lightning rod". "In other words, if Stolpersteine started to be desecrated by neo-Nazis or Muslims we would know that Germany is facing an anti-Semitism issue," he said. In the meantime, Swartzberg's group has installed more than two dozen Stolpersteine on private property, beyond the reach of city authorities, and has around 300 blocks in a cellar ready to be laid. Bernhard Purin, director of Munich's eight-year-old Jewish Museum, said the city had long lagged behind in owning up to its past. He said the Stolpersteine represented a "new, democratic" type of memorial, particularly appealing to younger people. "Those who don't approve should perhaps be a little more tolerant," said Purin, 51. Many in Munich admit the emotional debate around the Stolpersteine has forced the city to address painful questions. Rudolf Saller, a 59-year-old civil servant, insisted Knobloch's views should prevail given her stature. "She was democratically elected by her community," he said. "The people who are most affected should have their say." Yet many in Munich seemed to have embraced the project already, said patent office employee Martin Müller. "Soon all the survivors will be dead," said Müller, 48. "We need a way of remembering that stays with us in everyday life." Grube noted that beyond the six million Jews slaughtered in the Holocaust, groups including resistance members, gays, the disabled, Sinti and Roma and Jehovah's Witnesses were also targeted for extermination. Little wonder the Germans lost - where would they find the time or manpower to fight a war amidst all that "extermination" activity? I think it is fitting that 'stolpersteine' translates to 'stumbling blocks', and 'Stolpersteine' with a capital 'S' translates to 'pitfalls' in English. Why do the numerous typhus victims of WW1 and its aftermath deserve no stolpersteine in German cities too? The city of Munich has finally decided to lift a ban on the building of a Holocaust memorial there just in time for the 70th anniversary of the liberation of Auschwitz. Also, an American appellate court has refused to hear a case brought by Holocaust survivors. Ten years ago Munich put a stop to a project called Stolpersteine (“stumbling blocks”) in which brass plaques were placed in the ground all over the city. The plaques bore the names of residents who were murdered in the Holocaust and were placed in front of their former homes. When the ban was imposed some plaques were actually removed shortly after having been put in place. Now the project, which is being conducted across Europe, can resume. The project was begun by Sculptor Gunther Demnig in 1996. The ban came as a result of complaints from even Jewish residents who felt that people walking over the plaques would be disrespectful to the victims’ memories. The 50 thousandth such plaque was recently installed. Meanwhile an American Appeals court in Chicago has upheld the dismissal of lawsuits brought by Holocaust survivors against a Hungarian bank. The court ruled that the plaintiffs must first exhaust all of their option in Hungary before filing in America. hermod wrote: Why do the numerous typhus victims of WW1 and its aftermath deserve no stolpersteine in German cities too? You could go on on this. The usual gimmick is to list 70 year olds as "murdered", after they were listed as deported. Also not that this is done without consent. They (The Holocaust-obsessed cadres) do it, because they can. Almost nobody would dare to contradict them. And get the symbolism of this all. It's inserted, at expense of German taxpayers. to let them stumble. That's adding injury to insult. How psychotic must one be to let this be done by someone to you without even speaking back? And also those pushing for the "stumbling stones", which are actually made from some type of brass, must be quite obsessed and psychotic. Unfortunately, sir, Germans are not allowed to speak up about the actions of malformed Jews. Truly, the sick obnoxious self obsession of Jews knows no bounds. Living in a world of their own lies has resulted in massive form of mental illness & irrational hysteria we see in them. These 'stolpersteines' would be more appropriate, and fact based, if they were placed in Israeli cities & towns listing the very real murders of countless Palestinians by Jews. The names on the brass are from various NS-"victims" including habitual criminals. But being jailed by the NS-government suddenly turns them into saints. More then often the biographic info on the stones is rather vague. But that has never really concerned the pushers of the Holocaust narrative, now has it? They are interested in psychological effects, not hard, verifiable facts. The only person assigned a death date is Gertrud Meyer, she presumably died age 77. That sounds like natural death. The others have no death date given. My guess is that only a deportation record exists and nothing is known what happened to them afterwards. Probably never returned to Germany or were deported further East, which means they ended up behind the iron curtain with no further communication. There is no proof that anyone of those people were murdered. Yep, there before the war, not there after the war=jew murdered in gas chambers. That in turn perpetuates the jewish victim culture of sympathy and power and influence and money.